marcosbessa: [EN] Mike Doyle, THE artist of the moment! A few days ago I've shown you his work, now it's time to properly introduce you the man behind the masterpieces. Since my last post about him, I was thinking about getting in touch with him to ask a couple of questions. But actually he was the first one contacting me to thank me for blogging about his creations. I took the opportunity and invited him for a "mail interview", that he promptly accepted. 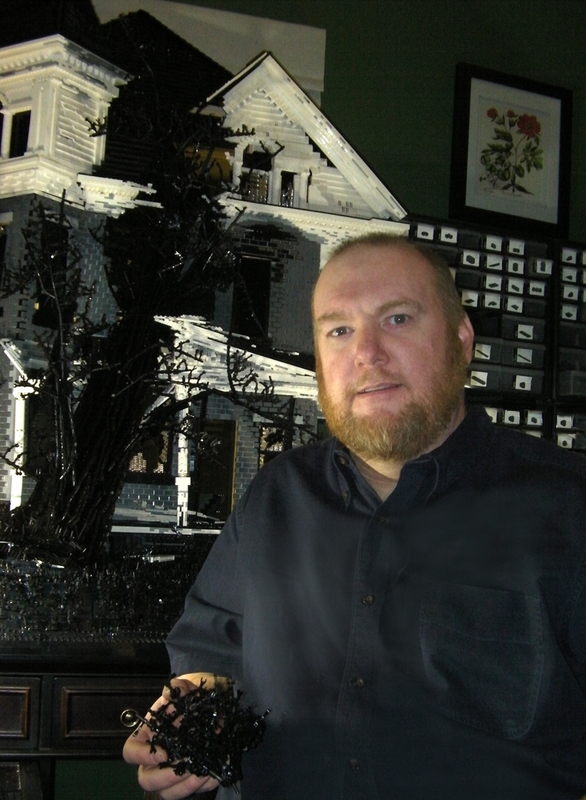 So here he is: Mike Doyle, the 43 years old graphic designer that has been catching the LEGO fans attention lately! Married, father of two little boys, 4 and 8, and working at a design agency in NYC, he got the time to find an all new way of using his creativity, and in such a short period of time, he has already conquered his own spot among the LEGO fan community. When did you first interact with LEGO? I remember playing as a kid a lot – throwing all the pieces I would get from the sets into a large cardboard box. I think I built the typical kid stuff, castles, houses, spaceships and things like that. I was an introverted kid as well, so I spent a good deal of time playing by myself drawing, building and reflecting. Nowadays, what are you favorite LEGO themes? I don't know. If you speak of sets, I'm not too interested in sets. I think the same for themes. For MOCs, really anything can interest me if it looks like something I've not seen before. When have you built your first MOC (My Own Creation)? Well, technically, as a kid with that box of pieces. But, after having given that up in my youth, I recently picked it back up (about 8 months ago). This first MOC was the abandoned Two Story house that I call Two Story with Basement. I wanted to do something different – for me, this was important. I also gravitated toward buildings. Additionally, I’ve been fascinated with abandoned homes and the beauty of decay for a long time. 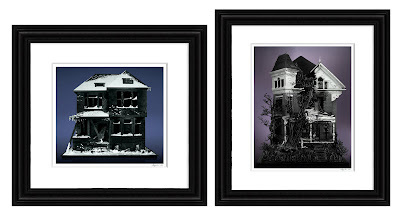 Things came together and I decided I would work on this as a series – that is, a series of abandoned homes. I figured early on that I would limit this to just black. Much like sculptors might carve out of a white marble or cast out of bronze, the piece would be monochromatic. I thought this could help lift it up a bit and seem more artful. Also, I had a hard time finding colors that could make something feel as realistic as I would like. As this first piece evolved, I began to add snow. For this, I now needed white. So, the piece took on a black and white form. I didn’t really know what I was doing. I knew it needed to be big to capture the details I wanted. But, I didn’t really know how to build beyond stacking bricks and plates. I spent a lot of time examining everyone’s works and the pieces they might have used to create with. Also, there were a number of good ‘how to’ pdf guides that people had written on advanced building techniques. Finally, I looked up LEGO Corner Café building instructions online to figure out some techniques the pros had used. I actually saw some of your work as well – a house with shingles on the side. That piece was a big help as it suggested to me there was a way to do shingles. One route that I take in the building process that is perhaps a little unusual is the manner in which I visualize the work. I think of the work as a two dimensional (or perhaps 2 1/2 D) piece. That is, I look to create the best single image possible through a photograph rather than a full model that looks good from all angles. I use the depth that I have through a 3D build to give the photo more life. So, rather than build a 3D model that gets photographed, in my mind, I design a photograph that is built in 3D. The difference here is that all the visual energy and decisions are focused on that single ‘best’ view, that will ultimately be my photograph. In this way, everything I add to the piece can be positioned to look best for the photo. Your second creation, the Three Story Victorian with Tree, had the ungrateful task of overcoming the first work, but surprisingly you did it amazingly well! It must not have been easy! Thank you Marcos! There were a couple of times in the end, where I was getting a little burned out due to how long it took. (I have no idea how some folks can spend years on a project!) Most importantly though is the fact that I am passionate about this – as I am sure you and other AFOL/MOCers are. Many days it is nearly all I can think about. As such, it is the passion that drives. At a certain point, when I realize that I'm on to something and this could be really good, I feel I have no choice but to try and retry again until I get something as good as possible. Most of the MOC was built and rebuilt 3 or 4 times before I got what I wanted. This due in part to lack of experience, but also a drive and passion to create this thing which I have in my mind's eye. Where do you get the elements for your creations? All my LEGO are from various Bricklink vendors. I love that site and the service these individuals provide. It is and they are absolutely fantastic. On your blog, you are selling a "Limited Edition of Collector's Prints". Where did you get the idea? What can your "costumers" expect from this? These are lovely signed and numbered prints about 10" - 13" (depending on the proportions of the photo), limited to only a few hundred (200-500 or so) depending on the image. I dismantle these works, so all that is left of them in the end are these prints and whatever is floating around on the internet. That means once the print is sold out, there will never be another image of it – making it very limited. These also come with a signed, numbered and stamped certificate of authenticity, a note that I've written about the piece that has some more background information on it and, finally, an actual 'chunk' of the model itself. This chunk is glued (so that it will remain intact during shipping, etc) and put in a small zip lock bag that is attached to a card. This card has an illustration of the model and a mark showing exactly where it came from on the model. Usually, the chunk is around 5-15+ pieces depending on the size of the pieces and as a whole is around 1.5" or so. Selling prints just came to me as I was finishing my first model. The expense was so great, I needed some way to begin to recapture some money for the hobby. In terms of selling the chunk of the model, I had wanted to offer something very unique that no one could ever get with a print and this seemed interesting. Also, going back to this theme of celebrating deterioration, including pieces broken off of the model seems a good fit. In terms of the buildings and atmosphere, I look through flickr to find pictures people have taken. Abandoned houses, the way snow accumulates, overgrown yards, trees that have fallen on houses are all things I investigated. Even if a building I find is not of interest, often a deteriorated part of it can catch my eye. In terms of technique, I'm incredibly inspired by all the MOCs out there. There is so much incredible innovation, it blows my mind. Looking at these really helps to get an idea of how to better assemble the pieces. What kind of "preparation work" have you done for your first two creations? Basically, I do the image search, as mentioned, and look through other MOCs to see how others have handled technique. I'm constantly going through all the blogs and posting sites, like MOC pages and flickr, to view everyone's work. Scale is determined by identifying a part of the building that I think I want to match a LEGO piece with. 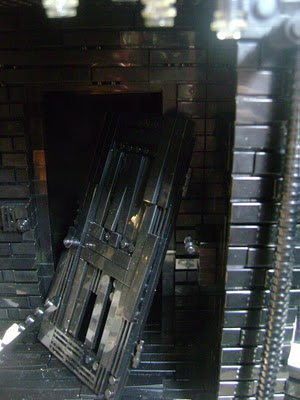 For example, on the last piece, I came close to making the bricks on the house about the size of a 1 x 2 tile. From there, I just start building. Usually, I have to remake things 3 or 4 times before I get them the way I want, so it is sort of a 'feel as I go' thing. As far as I know you are quite new in the LEGO fan community. What brought you into this huge and creative universe? It came about due to a visit to LEGOLAND last summer. We were in a section where you can make your own car and roll it down a ramp. I was ‘watching’ my son and nephews but really totally into making something for myself. After an hour or two we came out as the rest of our party was waiting for us, but we really all wanted to go back in and continue building. I went back to my hotel room and immediately began to look online to see what was out there. I wasn’t sure if adults were building with LEGO or if people were photographing them. Boy, was I surprised to see the incredible work out there! I had no idea. Suddenly, that little car I made seemed so trivial. But I also saw – through these works – just how far this could be taken. It seemed like there were no limits. Though you are "new in the market", you have already made quite a buzz around the "LEGO side of the Internet". Were you expecting this? How do you feel about it? Not really. I knew the pieces would have a different look and there would be some interest but I had no idea that much and the speed at which folks would see the pieces. I figured I would post on MOC pages and perhaps a few people would see and then after a number of months or a year would go by and maybe it would get noticed. But to my surprise, in a matter of hours many, many more saw this than I thought would in a year! It helped hugely that Brother's Brick posted my first piece only hours after I put it on MOC pages. Basically, I got extremely lucky. In terms of how I feel about it, it certainly feels good to get recognition after all the work and expense. Feels very odd too. The comments are so enthusiastic, I don't feel worthy. I see all the incredible other stuff out there and the techniques people use and I think I'll never be able to get that good. Lots of very, very clever work being done. Hopefully, I can learn quickly from others. It also puts a lot of pressure on me in terms of the next work. I feel that I have to do that much better for the next time and don't know if I have it in me. In the next piece, I will really have to stretch myself and how I execute. Do you consider yourself an AFOL (Adult Fan Of LEGO)? Have you ever been to a Fan Event? If yes, which? No, but I hope to go to one to see what it is like. Do you have any references regarding AFOL builders? Can you name some? In terms of AFOL builders, I'm very bad at looking at the names or connecting an individual to a body of work. I'm usually skimming through all the sites focusing on the pieces. There are only a couple of names that come to mind, Katie (eilonwy77) does these incredible patterns. Her material is different enough to stand out. Also I saw Jordan Schwartz on Blocumentary and keep seeing his pieces pop up. Also I know of Sean Kenney and Lino M..
My next piece will be what I happen to be excited about the moment I start building. A few weeks ago I would have told you I would be creating collections, perhaps of minerals. But now, I am excited again to work on another from this series. I think it will be a lakeside victorian summer home in the winter. I believe there are some interesting possibilities here. I hope you enjoyed reading this interview as much as I enjoyed to learn so much more about this great artist. Definitely someone to keep an eye on in the future! You can read more about his creations on his personal blog, where he posted the "making of" for each of them. P.S. Podem ler a versão traduzida para Português, aqui. One wonders if it+s worth continuing MOCing, as I know I'll never get to that level of detail!